Please check here for our Lobster Recipes! All of the recipes will help you prepare your order for that scrumptious occasion. We thank you for stopping by! Please tell all of your friends, family, and associates about us! Do you have a Great Lobster recipe to share? If so, please email it to us and we'll put it on this recipe page and of course, we'll give you credit for it! "The Fisherman's Table: Recipes Caught from the Sea"
We are happy to provide a sneak preview of some select recipes from a new New England seafood cookbook, "The Fisherman's Table" from Laura Blackwell. These recipes are intended for your personal enjoyment, and cannot be republished or resold. All recipes are copyright of Chef Laura Blackwell. 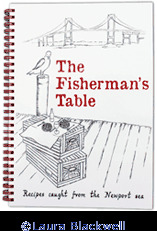 Add a copy of The Fisherman's Table to your order!